"Star light, star bright, which Paladins champion should i pick?" Jenos is a support hero with 2600HP and one healing Ability. 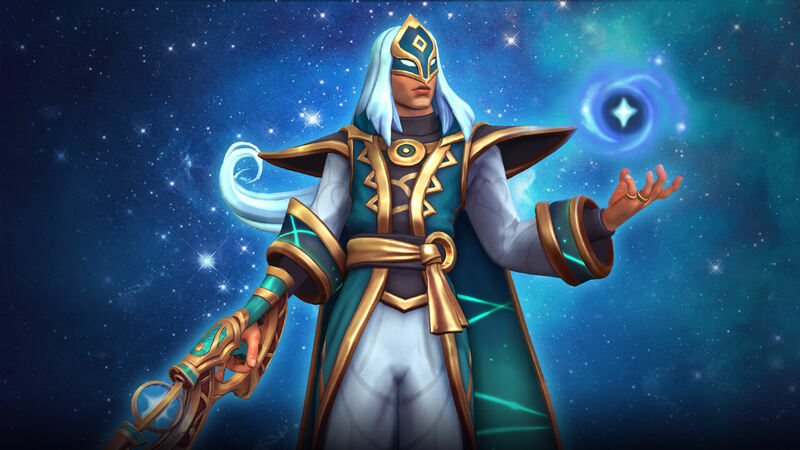 Jenos' primary ability (his weapon of choice) is the Star Splitter, a mid-range automatic weapon that deals 120 damage every 0.13s (923 damage per second). Jenos' secondary is Astral Mark, an ability that heals up to five champions and up to 250HPsec (50 per champion) with a 9sec cooldown and a potential duration overflow of 150%. Then we have Void Grip, a 0 cooldown skill that locks an enemy up in the air and deals 150 damage per second for 2.5 seconds. Movement abilities from the enemy interrupt the effect. Stellar Wind gives Jenos movement boost with 75% faster speed and bigger longer jumps and falls. Jenos cannot fire during Stellar Wind. Jenos' ultimate, Through Time and Space, locks him in to place for 1.5sec with immunity to CC damage and then releases a long range blast that causes 2400 Damage in a straight line, regardless of obstacles or walls. As stated before Jenos is available to play now!